Award Winner Professor Sharon Bolton. 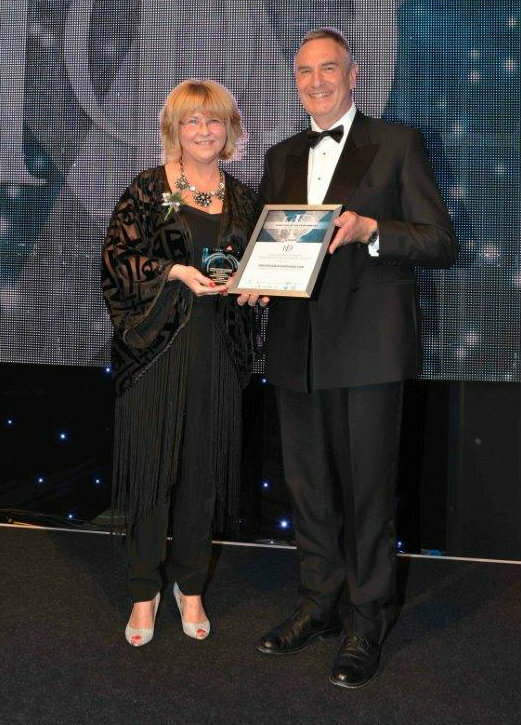 The Head of the University of Stirling Management School has been named a winner at the prestigious Institute of Directors (IoD) Scotland Director of the Year Awards. Professor Sharon Bolton received the Fife & Central Scotland Regional Emerging Director title at last night’s black-tie event held in Glasgow. The Awards are Scotland’s chief platform for recognising the top directors from public, private and third sectors. Professor Bolton, who is also the University’s Dean of Equality and Diversity, was also a finalist in the Fife & Central Scotland Regional Director, and Public Sector Director, categories. She said: “I am thrilled to have received this prestigious award of Fife & Central Scotland Regional Emerging Director of the Year from the Institute of Directors Scotland. “It is a real privilege to be Head of the Stirling Management School, and this award is testament to all the hard work and enthusiasm displayed by our Executive team, academic and support staff, and students. The Awards recognise the work of Directors carried out during 2014 and were open to all Scottish directors, executive and non-executive or equivalent, whether IoD members or not. Success, ambition and excellence are celebrated in the application of directorship and leadership. The Regional Emerging Director Award was newly introduced this year, in recognition of the wealth of talent in Scotland. Its recipients, from the six IoD Scotland regions, are the most dynamic, resourceful individuals – the ‘ones to watch’ for the future. During financial year 2013-14, research income rose by 27 per cent, and in the 2014 Research Excellence Framework rankings, the School’s world-leading work placed it in the UK’s top 25 for Business and Management Research and 14th for research impact. Fergus Ewing MSP, Minister for Business, Energy & Tourism, gave the keynote address at last night’s ceremony, which was hosted by BBC and ITV broadcaster, Kaye Adams. The IoD had received an even greater number of nominations than ever and there was strong competition in all categories. Stirling Management School believes that management matters, and it supports a sustainable future for business and society. Students develop leadership skills vital for businesses and organisations across the world. With internationally recognised and accredited courses, Stirling Management School takes a contemporary, career-focused approach to higher education delivery. Nine out of 10 of its graduates find relevant employment within six months of completing their degree, and the School has an extensive alumni network. In the Research Excellence Framework (REF) 2014 the School is ranked within the UK’s top 25 institutions (the top quartile) for Business and Management. Over 90 per cent of its research impact is rated either world-leading or internationally excellent. The Institute of Directors (IoD) in Scotland exists to help, support, advise and set standards for directors. In Scotland the IoD operates from a base in Edinburgh and through a number of branches focussing on the Highlands & Islands, Tayside, Fife, Aberdeen, Edinburgh and Glasgow. A small team of professional staff led by Executive Director, David Watt, work with a team of volunteers headed up by Chairman, Ian McKay – a University of Stirling alumni - to deliver a range of activities, events and development opportunities all across Scotland. The IoD is strongly committed to increasing board diversity.